Imagine you’re back during your art class where you’re actually in school to be creative. You have a whole period full of possibilities where there’s no pressure to get the highest grade, but to just enjoy the moment creating something that makes you happy. What a thrill isn’t it? That, my friends, is what creative a vision board is like, but with the intention of being that daily reminder and that constant guiding light for your year. But wait, what is a vision board? A vision board is where you keep all your dreams and goals posted in one space usually a corkboard, a frame, a metal wall–the point is that it’s a spot that you look at many times during the day. It’s a visual reminder of your goals. So let’s say you want to become a successful content creator, you use this vision board as your source of inspiration and a reminder why you started. There is no right or wrong way to make a vision board. You create a vision board that fits your personality and your goals. It has to feel right for you. The first thing you can do is to choose where you want your vision board to be. 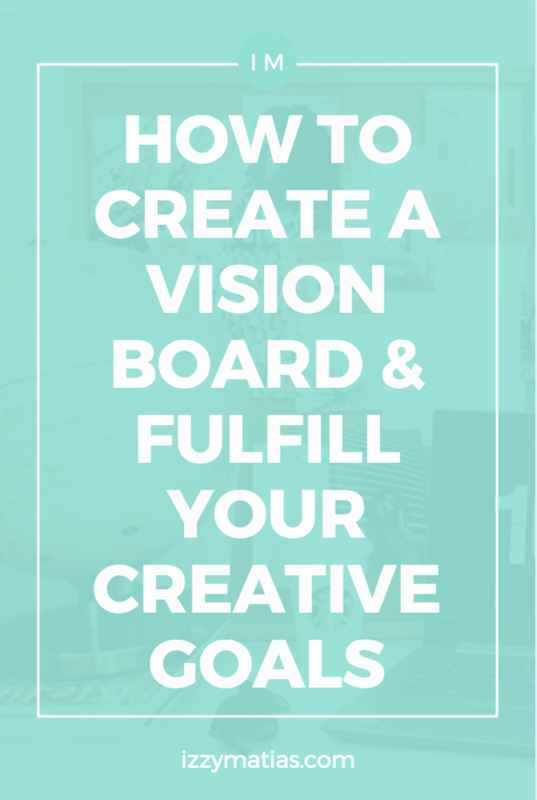 So if you want to make your vision board in on your Pinterest account, a Powerpoint presentation, a secret blog, a cork board, or a notebook, it’s up to you. Go with the medium that you love and see on a daily basis. For me, I have a white metal grid panel that’s at the back of my desk. I would pin reminders and things that made me feel inspired or happy, but this year, I want to use it as my vision board since it’s something I see every day. I also spend most of my time on my desk, so it’s a good place to really have all those daily reminders & goals to help me stay focused. If you’re overwhelmed with what specific goals you want to achieve, you can start with a mini bucket list of what you want to achieve this 2019. From that list, I would suggest to narrow it down into 3-4 big goals you really want to focus on and build your vision board from there. One little tip for you is to put your purpose of why you create the content you do in your vision board. Not only will this serve as a daily reminder, but during the times you feel like giving up or feel burnt out, you can remember why this goal is important to you. Take a break, but don’t quit. For me, this part is the most fun because I get excited choosing these photos, phrases or affirmations. And it’s inspiring to see the photos because it feels as if you’ve already achieved these goals. So, again, your next step is to go to look for these visual prompts of your creative goals that you’ll be placing or printing in your vision board. Go on Pinterest, Unsplash or even Google to get inspiration flowing! 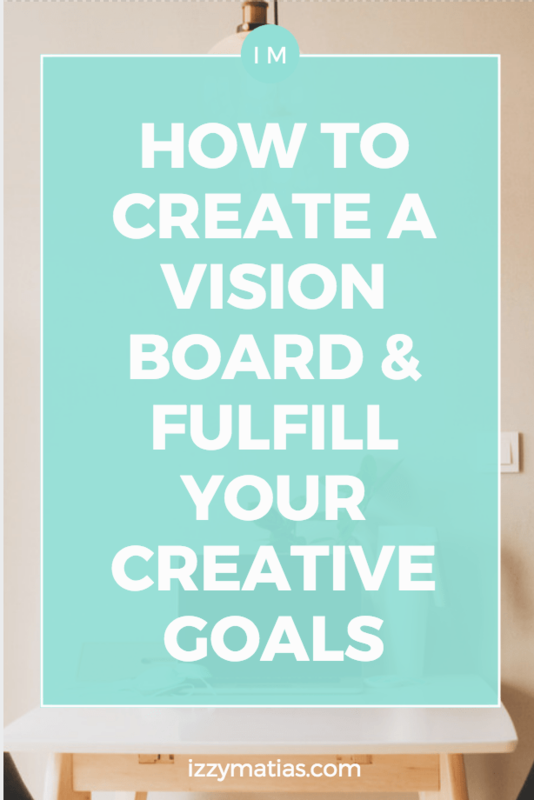 Normally creating your vision board ends once you’ve posted and compiled all materials into your “board” and put it in a place you see every day. But I’m going to go further. While that’s all good and done, the crucial combination to making those dreams and goals into a reality is to take action and believe that your goals will become your reality. You know that it’s going to happen. You truly believe. I believe in The Secret and I’ve seen it work in my life: like the time I was able to study abroad. If you are not familiar with The Secret, it is a philosophy centered on the law of attraction. What this means is that whatever you believe is what manifests in your life. The opposite is also true. When you feel grateful for what you have, great things are always coming your way; like brilliant shooting stars that never seem to fade. However, if you simply put up pretty photos and inspiring phrases up on your vision board and don’t do anything to make your goals happen, then how can they manifest into your life? Yes, you believe, but you lack one last crucial ingredient: doing something. For example, one of the big creative goals you have for this year is to grow your e-mail list to 1,000 subscribers. If you don’t make an effort to study email marketing, create an opt-in freebie or actively promote your e-mail list, then how on earth can you expect your list to grow to 1,000 subscribers? To make your dreams come true, you have to commit to finding and creating opportunities for you. Don’t wait around for a miracle. Focus on making things happen so that miracle will come to you. It can be as simple as reaching out and emailing a brand you’ve always wanted to work with (of course you’ll need a great pitch! ), but the point is that you made it happen instead of waiting for that dream collaboration to happen. If you don’t get a response, at least you tried. If you do, then the doors of endless possibilities have been opened. There’s no turning back! So how do you incorporate this into your vision board? Going back to my example of wanting to collaborate with brands, one step you can take is to send out a pitch a week to one brand or maybe research the press contact for all the brands you want to work with. Be sure to print out this action step and place it beside or on top of the photo that represents this goal. Doing this will feel like you’re one step closer to that dream because you’re actively doing something to make it into a reality as opposed to sitting around and waiting. You can choose to do this in two ways: incorporate your positive affirmations as big print-outs in your vision board or have one positive affirmation to go with each of your goals. Remember: don’t pressure yourself to achieve these goals. Your vision board serves as inspiration and a source of excitement that your dreams are within reach especially when you believe and have faith that they will happen. That’s it! Tag me in your photos on Instagram at @izzmatias. I’d love to see your actionable vision boards!